During my first fashion week ever I quickly realized I didn’t know nearly as much as I thought I did. I didn’t know the people at the shows, I didn’t realize most of them were friends and that this would make me self-conscious. I didn’t know that every show would start at least 10 minutes late and then would only last for about 10 minutes. I didn’t know that even though the shows never started on time, I’d also be consistently late and running and very, very hungry. My second fashion week, I thought I’d learned all I needed to. I actually had some friends at the shows, decided not to panic when I wasn’t on time, and packed not one but two protein bars into my bag (and an external charger). But by my second show I realized not everything I thought I knew was true as I sat down for a cup of tea, and ate my third consecutive finger sandwich at the Cinq A Sept presentation at The Pierre. An hour later, I was eating a scone with jam and butter at Saks Potts. Thirty minutes after, I was chasing down a pink macaroon with a glass of champagne. I think I attended more shows where I ate something than not. By the time I made it to dinner I wasn’t even hungry. Instead I kept looking past the plate and down at my feet, my clutch leaning against my boots; the wrappers of my two protein bars snatched in it’s zipper. 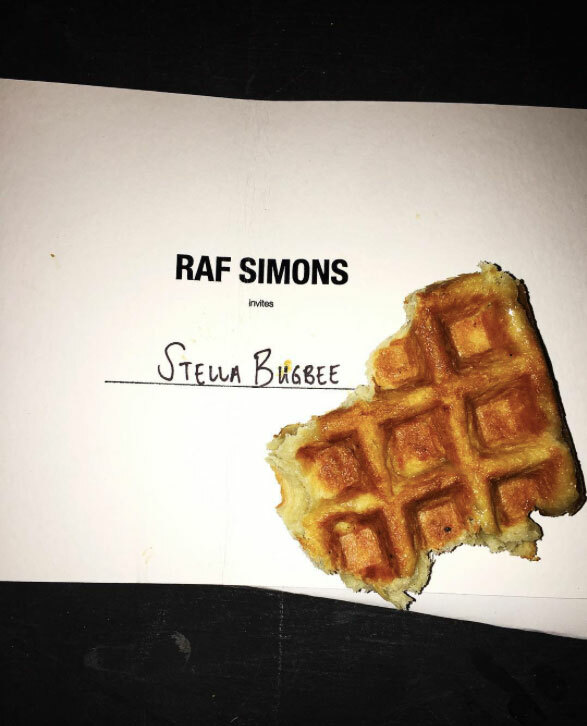 NYFW started with Raf Simons’ men’s show runway covered in Belgian waffles and ended with his popcorn runway for Calvin Klein, but lots of other designers served up something edible—and it served as the perfect, albeit unexpected, accessory. Were they all collectively hungry, or did they all decide that a well fed audience (okay, okay, most people still didn’t eat anything) was better than the alternative? Whatever it was, the crowd at NYFW loved it and fashionable food photos were all that I saw on my instagram for days. So not only can you have your cake and eat it, but you can wear it now, too. Here’s how. At Chromat, some outfits matched that can’t-get-it-off-your-fingers-neon-orange shade of Cheetos, and had snack pockets for an actual bag to bring everything full circle. Models wore Cheetos, and ate them during their catwalk, and did it all with a lot of ferocity. Eating in line while at a bodega at 3am on a Saturday has never sounded so...chic. 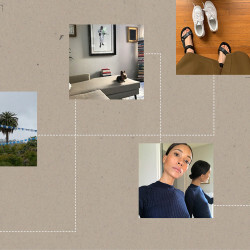 Rosie Assoulin found a book on marbling techniques from Turkey, Japan, and Italy and designed an assortment of custom marbled velvets, silks and cottons for her fall collection. The meringues, cheesecakes and crepes at her presentation, all created by chef/artist/wizard Laila Gohar, were also rainbow marbled. Take some inspiration from the designer herself and throw a tie-dye party at home, it’s not necessarily as fancy as marbling, but it’s just as colorful and swir-ly, especially if a matching cheesecake with color dye is involved. Bonus points if you can get Laila to attend. 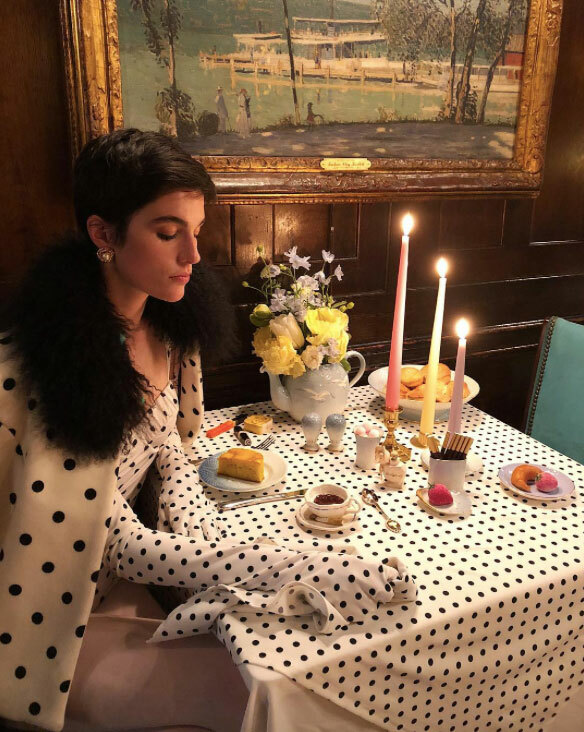 Saks Potts, Cinq a Sept and Miaou all threw a tea party. Saks Potts came complete with scones flown in from Copenhagen. Cinq a Sept hosted guests around a tower of mini pastries at small tables circling a giant maypole. Miaou took everyone to a Parisian cafe at the Standard Biergarten with macaroons and champagne for a midday snack. Each show made it clear: a mini pastry and a cup of tea will both make you look and feel like you’re Jeanne Damas or Pernille Teisbaek. On Raf Simons’ elevated runway for his menswear show, models wearing clothing adorned with the word “DRUGS” walked a waffle lined runway. Lots and lots of waffles. Next time you throw a rave or even just a party with strobe lights, consider pulling out your waffle maker. It’ll provide some much needed sustenance—especially if your guests take Simons’ messaging literally. Sandy Liang is known for her jackets that look (and feel) like colorful, shearling clouds. 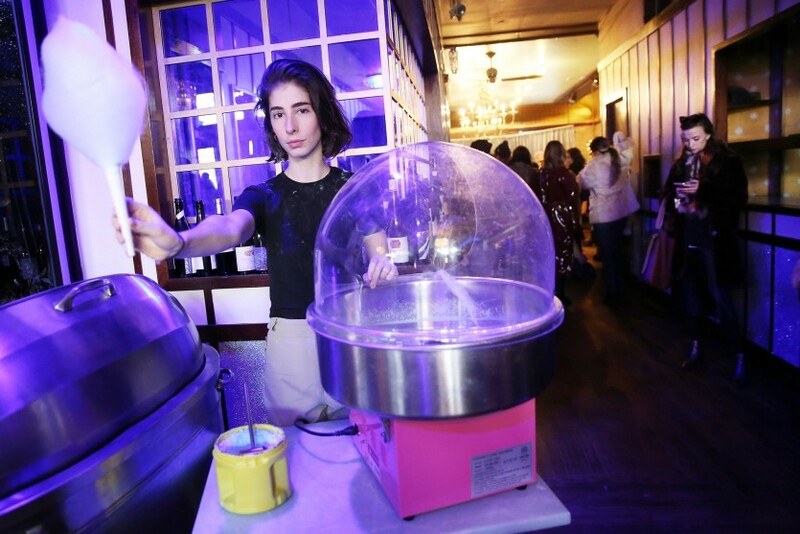 Of course it was fitting that entering her presentation involved walking past a cotton candy machine, and getting a stick of the sugary fluff for yourself—there has never been a more perfect combo. If nothing else, it’ll look great on the gram. Snow Xue Gao’s show took place in Jing Fong restaurant in Chinatown and models weaved around the restaurant tables with pink bags of takeout. 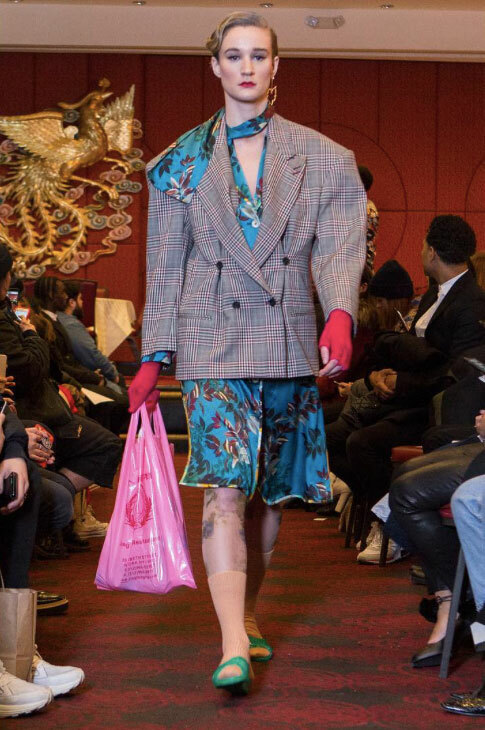 If there was ever a time to carry a ton of plastic bags and make it fash-un, it’s now. 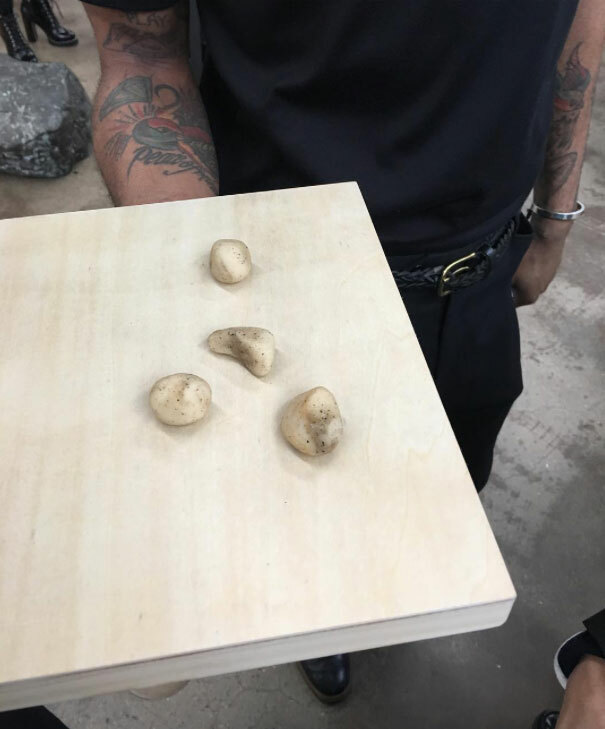 Leave it to Mary Kate & Ashley Olsen to bring never before seen Noguchi sculptures to fashion week. They also served scones that resembled tiny statue masterpieces because of course they did. If you want to wear Céline but can’t afford Céline, minimal, Olsen-inspired pastries will be the perfect substitute. 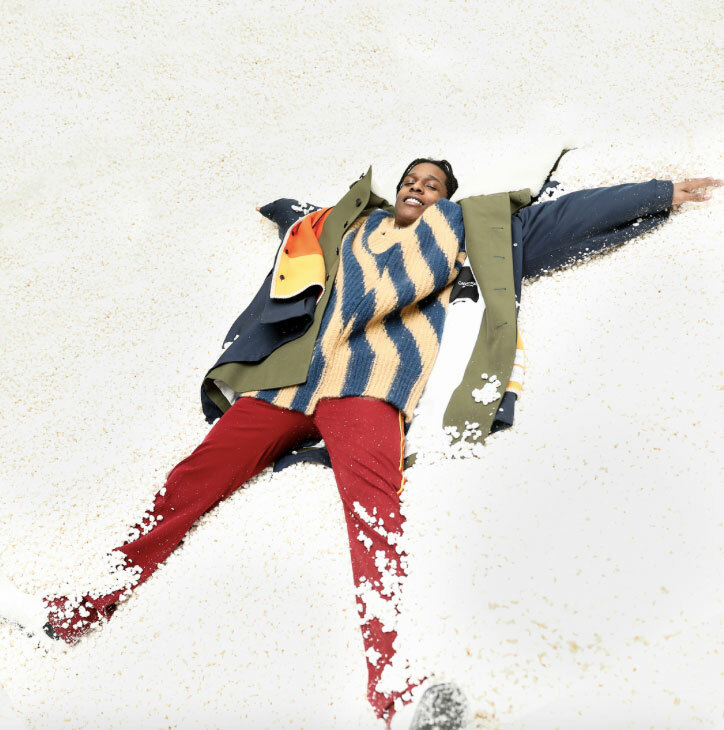 Raf Simons transformed the American Stock Exchange by creating a farm scene meets drive-in movie theater with popcorn runways to match. Everyone from Eva Chen to A$AP Rocky took photos in a popcorn pit after the show and of course everyone’s outfits looked great on the delicious backdrop. Basically, your next trip to the movie theater is the perfect spot for that Instagram-able #ootd. Just order some popcorn (extra large) and you know what to do next (just maybe make sure to pick it up after sprawling out in it).